At Country Meadow, our Labradors are a huge part of our family, as I'm sure yours are too. They are not just a pet to us, but a family member. We have taken many precautions to do our absolute best in producing healthy puppies. Although, there are many environmental contaminants and illnesses a puppy or adult dog can be exposed to during its lifetime. So, after much research and many trials, we have chosen a supplement that we feel is one of the best available for our Labradors, whether puppy or adult. I believe through the documented results and our own usage, Nuvet provides the extra protection we desire. Please check out the information below or go to www.nuvet.com for more details. At NuVet Labs® we really are “pet people”. We love animals so much it’s not uncommon for our employees to bring them to work. Even our President’s little Yorkie has his own cubicle. With millions of dogs and cats suffering from all sorts of ailments and health problems, we have made it our mission help heal our furry friends when they’re sick and then keep them healthy for years to come. It is this passion for pets that drives us to produce the best nutritional supplement you can find. NuVet Labs® has spent over 8 years to create a product designed to attack the causes of disease instead of just covering up the symptoms. To do this we put together a team of top scientific, medical and pet industry professionals that shared our desire to find real solutions to an ever growing pet health dilemma. NuVet® products are made in a FDA registered laboratory with natural, human-grade ingredients specially compounded to deliver the most effective nutritional health benefits. Utilizing the latest advances in medical and nutritional science, we apply state of the art manufacturing technologies to help us maintain a standard of product quality and integrity that is virtually unheard of in the pet industry. It is our pledge to the millions of pets, and to their human families, to continually produce the most powerful nutritional supplements that can help make pets healthy and keep them that way for a lifetime. Today’s pet foods, even premium brands, can contain toxins, and bad bacteria. Almost all use “meat by-products”; that is an industry term for anything other than meat. Many of the other ingredients are fillers like corn, wheat and barley. Which are prime sources for allergies, skin problems and other more serious ailments. The regulation of these ingredients tend to be lax, which means they could end up being tainted with disease causing pathogens. 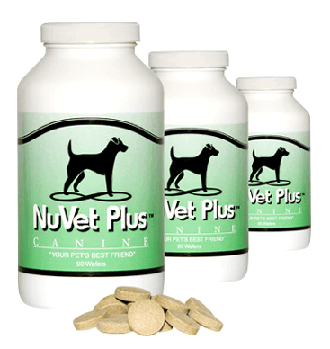 Our team of pet industry scientists, vets and medical specialists created NuVet Plus® to be a high quality product that incorporates a precise formula of vitamins, minerals, enzymes, herbs and antioxidants that performs synergistically to bring together all the vital ingredients required to improve your pet’s health and keep them healthy. NuVet Plus® is made using only Natural, Human Grade ingredients that are formulated in a FDA registered Pharmaceutical Laboratory. We use a special “paddle dried”, whole chicken liver that provides vitamin potency as well as a taste your pet will love. Pets are just as susceptible to joint diseases and ailments as their human companions, which is why we created NuJoint Plus®. Senior pets aren’t the only ones that can suffer from Arthritis, Osteoporosis, joint inflammation and aching bones. In fact pets of all ages often become afflicted with joint problems due to contaminated food, household and environmental toxins, injury and breed genetics. No matter what age or breed, your pet will find relief and long lasting health benefits from NuJoint Plus®, our specially formulated nutritional pet supplement. 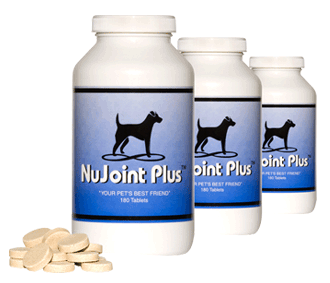 We’ve designed NuJoint Plus® to be a premium natural anti-inflammatory hip and joint therapy supplement. We use only the highest quality pharmaceutical, human grade ingredients that are specifically compounded in a FDA-registered laboratory for maximum potency and effectiveness. Our 8 years of research and development has created NuJoint Plus®, a nutrient rich product that goes to the source of the problem, combating joint and bone ailments with a wide variety of natural healing ingredients designed to be bio-digestible. Our cutting edge formula targets disease causing pathogens and free radicals by infusing the cellular framework of your pet’s metabolism with precise percentages of Glucosamine, Chondroitin, Methylsulfonylmethane (MSM), and Vitamin C.
NuVet® has been making the finest nutritional pet supplements since 1997. Our mission is to provide your pet with products that are completely safe, nutrient-rich and formulated to combat disease at their source, while strengthening the immune system and giving your pet many healthy years of life. 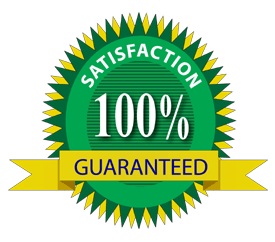 We are proud to stand behind our products with a 60-day, 100% satisfaction guarantee. If after trying the product you are not satisfied for any reason, follow the simple instructions below and we will give you your money back. Should you desire to receive a refund, please contact us via phone or email to obtain a Return Authorization number. Along with the Return Authorization number, we require the original bottle(s), along with any unused portion of product, to be returned to our office within 60 days of purchase. Customers are responsible for all shipping costs. Please note: Because your pet’s health is our main concern and our products are manufactured in an FDA-registered pharmaceutical laboratory, we do not re-sell the product once it has left our facility, even if the package remains unopened. Therefore, refund requests relating to repeat orders, including AutoShip orders not canceled prior to their scheduled shipment date, will be subject to a 20% destruction fee.